I saw your ad on Craig's List for the Cast Iron Meat Grinder, brand new http://toronto.en.craigslist.ca/tor/hsh/1102975787.html . 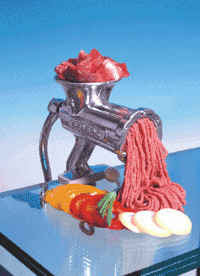 I have always dreamt of having a machine which I could use to pour endless rivers of freshly ground meat onto my salads. I assume that the recipe for what is in the picture comes with the item, but do you have any other recipes that come with it? Maybe a ground mutton Popsicle or something?